A DUST BATH???? WHEW! BETTER THAN WHAT I WAS THINKING! I won’t ask, although you’re probably thinking what I thought at first, until it dawned on me what the chicken was really doing! Thanks for the reblog, Jonathan. I was thinking some free-range coyote…! This is how chickens should be! Absolutely right, Cindy. I can’t bear to think of the plight of those poor battery hens. When one of my friends rescued some of them and rehoused them, the poor creatures had to have coats knitted them as they were bald and they staggered about all over the place as they weren’t used to walking. I’m glad to confirm that the hens now have feathers and are very agile on their feet! Me, too 🙂 See my comment to Cindy to read about a happy turn of events for some battery hens. Great image Sarah, so good to see the pleasure of that chicken. Yes, it was in its seventh heaven. And just after I took that picture, another hen came right up to me out of curiosity, to have a look at my camera! Oh the life of a chicken when the sky isn’t falling!! wonderful Sarah! 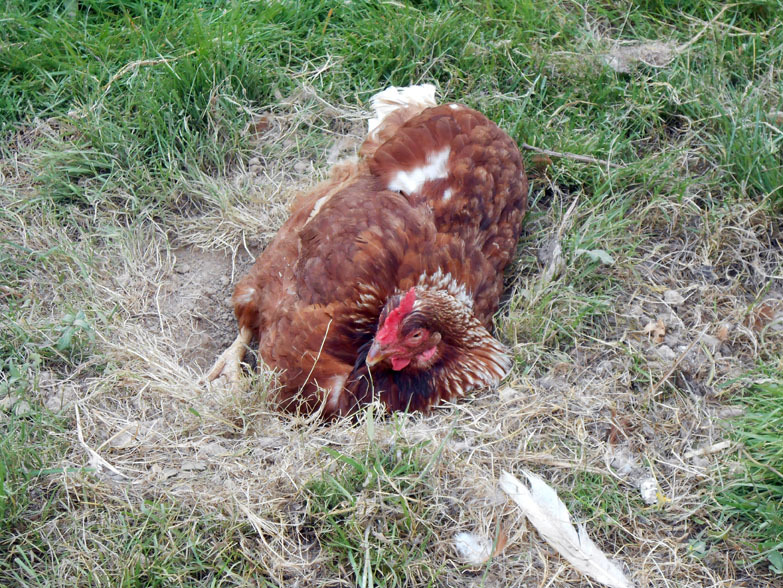 Thank you, Cybele 🙂 She was such a plump hen, I preferred not to ask her owner if she was destined for a long life of egg-laying or otherwise.